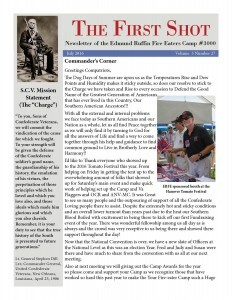 This issue is very informative in contains information concerning the reunion and other happenings that membership may find interesting. We are a member camp and we want to make it the best one possible for everyone and keep the camp moving forward and growing. We will be utilizing this information to help when selecting speakers/programs and in helping our individual compatriots enjoy the SCV experience. Thank you for taking the time to respond to our first camp survey. ORDER IN THE COURT!! ORDER IN THE COURT!! ORDER IN THE COURT!! HERE COME DE JUDGE; HERE COME DE JUDGE; HERE COME DE JUDGE; ORDER IN THE COURT!! DO I HAVE YOUR ATTENTION YET????!!! If you fail to get your buns down to the August 3, 2016 Fire Eaters Meeting at Anna’s Italian Restaurant you will miss out on all of the festivities, frivolity, fun, camaraderie, hoot’in, holler’in, laughter and food of the renowned Fire Eaters Fellowship and Dinner hour. Rumor has it that our Fun Bunch (you know who you are) was so loud and boisterous last month that the Governor had his State Dinner totally ruined all the way downtown in the Governor’s Mansion!!! You have got to be a part of this wild event coming up next Wednesday right up Mechanicsville Turnpike, across from Lee Davis High School. During that pre-meeting hour we do not have Order in the Court, we are proud to have DISORDER IN THE ROOM!!! You have got to get in on this stuff. Come on down and join in the fun. Seriously, the Fire Eaters have a great time together because we enjoy each other’s company. Additionally we have educational speakers making presentations about aspects of Southern history during and around the time of the War for Southern Independence. We need to know the true history of the South and the Cause to be able to counter the PC stories that are taught in schools. Our keynote speaker on August 3 will be Bert Dunkerly, of the National Park Service, talking about the battles and NPS battlefield parks around the Richmond area. 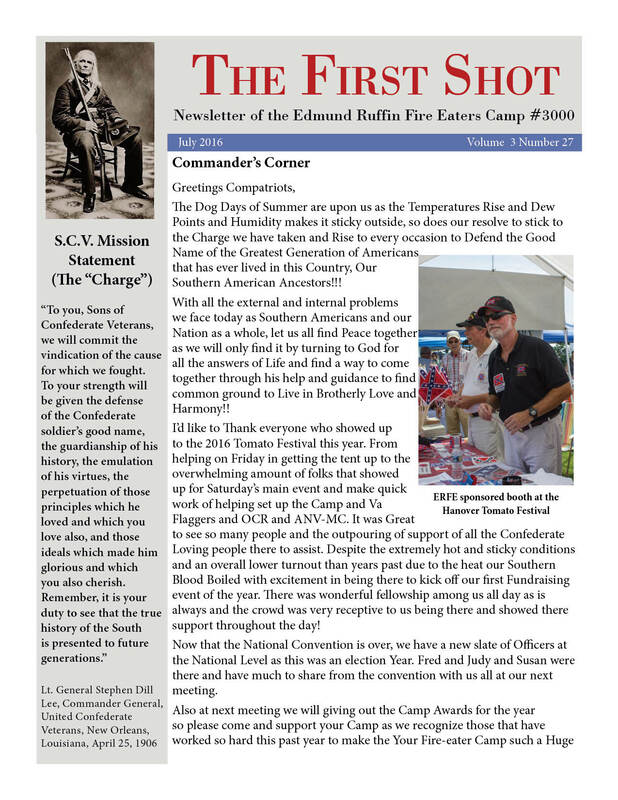 The members of our Camp are dedicated Sons of Confederate Veterans. We are fortunate to have tremendous support from the OCR members, the ANV Mechanized Cavalry and the Virginia Flaggers. You really are missing out on something important and special when you do not attend our Camp meetings. We need your participation and ideas to help us grow and continue the work needed to support the Cause, fly the Flag and and defeat those who want to tear down everything and anything Southern. COME ON DOWN. WE NEED YOUR SUPPORT. YOU NEED TO HAVE FUN JOINING OR JUST LISTENING TO THE FIRE EATERS’ FUN BUNCH!!! It is July already, 2017 is half over and it is time for Fire Eaters, Friends, Associates and OCR Members to gather to break bread together. Are you bored? Are you craving excitement? Are you searching for adventure? Do you feel there is something missing is your life these days of Summer? Hey, have I got the solution for you!!!!! O Yeah!! GET YOUR BAD SELF DOWN TO ANNA’S ITALIAN RESTAURANT THIS COMING WEDNESDAY NIGHT AT 6:00 P.M. FOR DINNER, LAUGHTER, EXCITEMENT, ADVENTURE IN SOCIALIZING WITH OUR WILDEST MEMBERS, AND LIVE ENTERTAINMENT. AND THAT’S BEFORE THE MEETING OFFICIALLY STARTS!!!!!! Support your Camp, and your ancestors by attending the July 6 Fire Eaters Camp Meeting. Our keynote speaker will be Will Glasco, who will speak on the Richmond Blues and the Battle of Roanoke Island. It is well known fact of life, documented by numerous officially sanctioned scientific studies, that those who attend Fire Eaters Camp Meetings have more fun that the Government’s Recommended Daily Allowance!!!! You know you want to be a part of that!!!! So Come on Down and Enjoy Yourself. Bring your family as well. We have about 60 members in our Camp. I look forward to seeing every one of you there to fill the meeting room, wave the FLAG, and demonstrate that SCV members are here to stay.